Nobody can resist a classic tiramisu and our version is super quick too. Nobody can resist a classic tiramisu and our family version is super quick too. This is the only recipe you’ll ever need! SEPARATE your egg yolks from your egg whites. BEAT the egg yolks with the sugar in a bowl or use a free-standing electric mixer until it goes creamy, light and fluffy. BEAT the egg whites in a separate bowl until they form stiff peaks. ADD the mascarpone to the egg-yolk and mix to combine, and then gently fold in the egg whites – be careful not to lose the lovely light air in the cream mix. SPREAD a thin, even layer of the mixture over the bottom of a serving dish approx. 22cm in diameter and 10cm deep (ideally a glass one). QUICKLY dip each side of the biscuits one by one, first in the Marsala and then in the coffee. Don’t let them absorb too much liquid, as they can get rather soggy. PLACE a neat layer of the soaked biscuits on top of the cocoa powder. CHILL in the fridge for at least 1 hour, and preferably overnight. TIP: When you put each layer into the bowl, try to avoid any dribbles on the side of the glass so that your layers end up being pretty and neat. 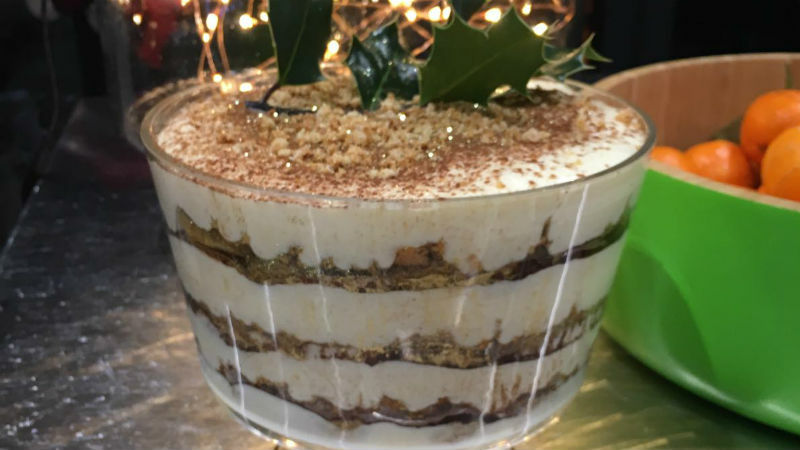 For a festive addition you can crumble a layer of amaretti biscuits as an additional layer.